Limited to 30 customers per day ! 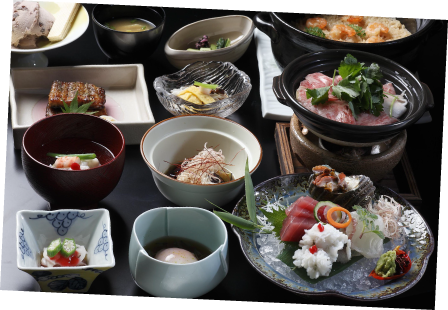 ★ A 9 small dish course that includes 3 different types of seasonal sashimi, fried food, chawanmushi（Japanese steamed egg custard） sushi and dessert. First, 9 seasonal small dish followed by fried food, chawanmushi, sushi and dessert. 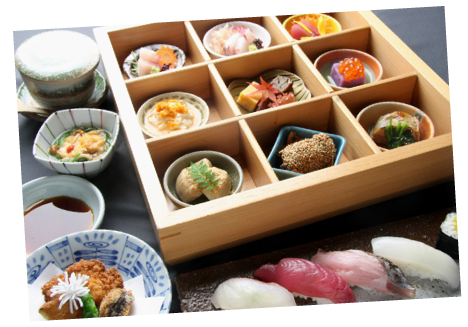 ★ A lunch course in which you can enjoy not only seasonal　dishes but sashimi and chirashi (scattered) sushi. Dishes are　served one at a time to give you that extra luxurious feeling. 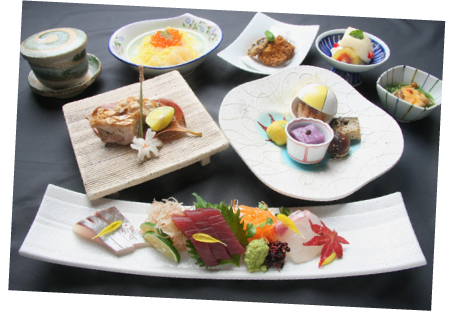 small dish, sashimi (3 types) fried food, seasonal appetizer, grilled food, chirashi (scattered) sushi and dessert. 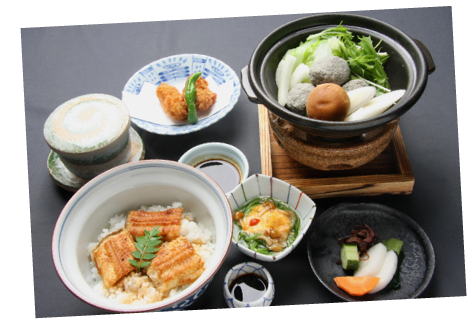 ★ Named after Prince Kiyomori, a military commander famous in Hiroshima, with this lunch you can enjoy Hiroshima’s famous oysters, conger eel, and baby sardine all at once. small dish, fried oysters, ground baby sardine dumpling hot pot, eel rice bowl, chawanmushi（Japanese steamed egg custard） and pickles. 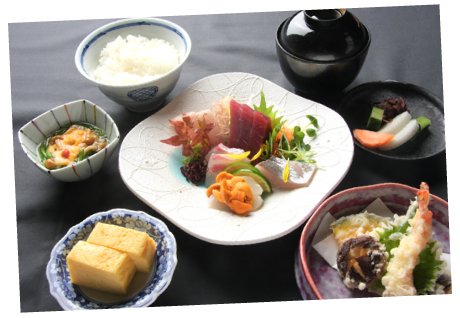 ★ A popular lunch in which you can enjoy Japanese food, dessert and a drink after your meal. Recommended for those that have never tried Japanese food. 3 types of sashimi, mixed appetizer, fried food, grilled food, chawanmushi（Japanese steamed egg custard）, chirashi (scattered) , sushi and Japanese soup. 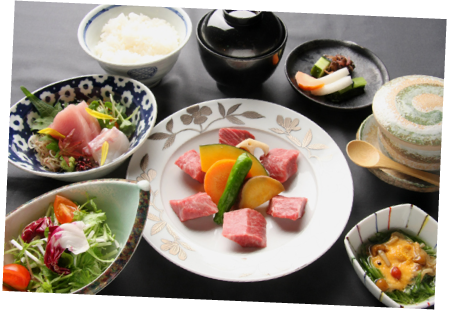 ★ A set lunch in which you can enjoy a high grade wagyu filet with our special soy sauce. Includes dessert and an after meal drink. Wagyu filet, 2 types of sashimi, chawanmushi（Japanese steamed egg custard）, rice and Japanese soup. ★ Sure to satisfy the sashimi-lover in you. We will serve you an assortment of our fresh sashimi that arrives daily from the market. Includes dessert and an after meal drink. Assorted sashimi, tempura, jako-rice and Japanese soup. 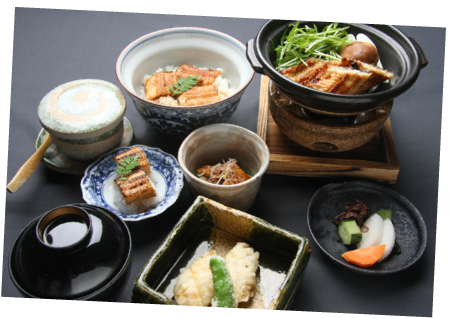 ★ Eel Yanagawa Style (small hot pot), tempura, rice bowl dish, eel sushi, chawanmushi（Japanese steamed egg custard）, Japanese soup, dessert and an after meal drink. 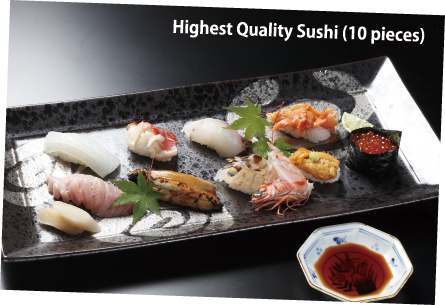 ★ You can savor our chef’s recommended 9 pieces of day’s highest quality sushi. 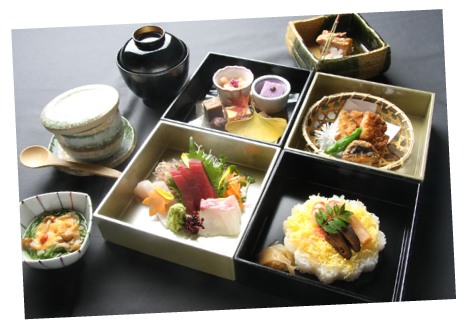 Include chawanmushi（Japanese steamed egg custard）, soup, dessert and an after meal drink. 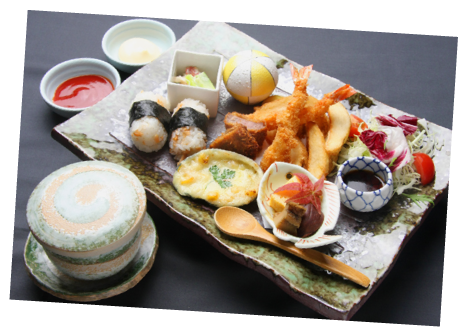 An 8-piece high quality sushi ( ¥ 3,000 ) and kaisendon (seafood rice bowl) ( ¥ 3,000 ) are also available. ★ An assortment of foods that kids will love. Comes with　chawanmushi（Japanese steamed egg custard） and a drink. A course meal created of seasonal offerings from Hiroshima and the straits’ land and sea that our head chef has carefully selected. ★ 2 appetizers, sahimi, grilled food, fried food, main dishes, rice and fruits. ※¥8,000 and ¥10,000 and ¥12,000 courses available. ★ Order single pieces as you wish. otoro, chutoro, maguro, marinated maguro, prawns, mackerel, yellow jack, yellowtail, squid, egg, simmered eel, simmered abalone. 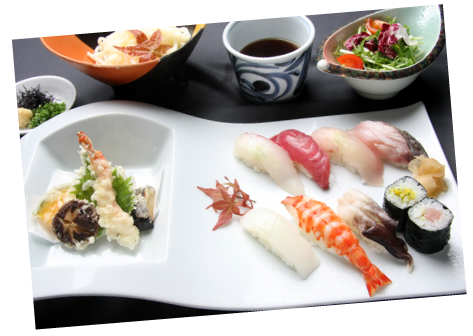 ※Other seasonal recommended sushi are also available. Please feel free to ask one of our staff. ※All rice is grown locally in Shobara, Hiroshima koshihikari Pref. Foods that can be prepared quickly & foods that go perfectly with sake and wine. ※(Prices will vary according to current market prices) Please feel free to ask one of our staff. ※Prices do not include consumption tax.